Very cool, I just love that wreath! Great card. Love the fab way you've put the door together. The button door handle is so cute. What an AWESOME idea! If only my front door looked that fabulous! LOL! Oh my! This is AWESEOME!!!!!!!!!!!!!!!!!!!!!! I am soooooo in love with that stamp but this design/idea is brilliant!!!!! What a great welcome home card! Of course the wreath is fantastic but what hit me over the head was your scoring to make this the perfect door and the button for the knob ....... fantastic card!!! OMG- I love how you turned this into a "door"! Awesome! That is a super cool idea and so CASEable! Great job! 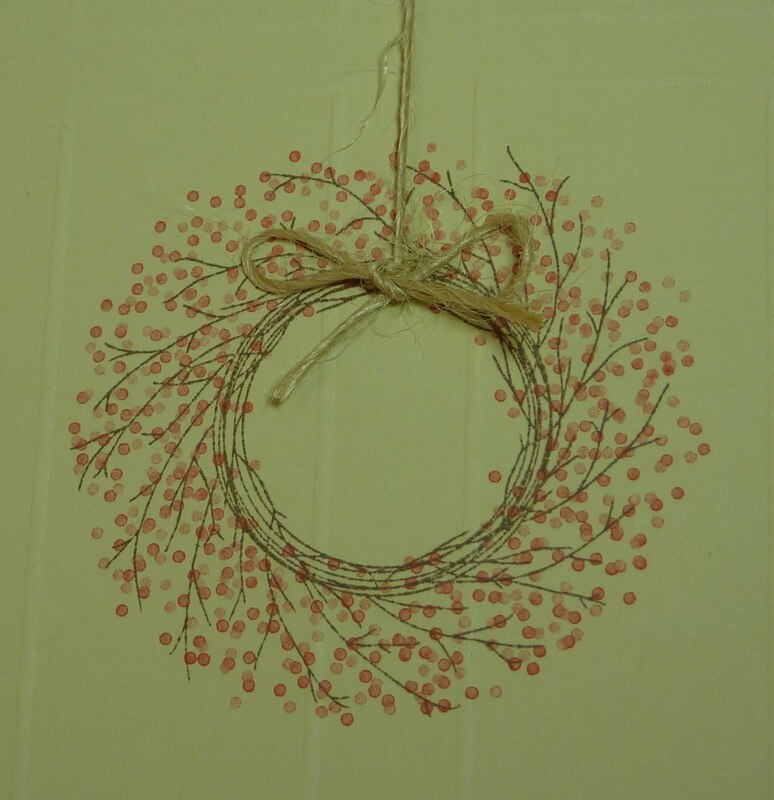 Your wreath looks just like a real one hanging on a door. Great job making it look so realistic. Oh goodness, this is lovely! What a creative, fun card! Such a great concept and a beautiful card! EEK this is so great! The scoring is perfect and I love the button door knob!! Fabulous colors, tooooo! Just awesome! I had to add this to my bookmark folder called "Projects I want to do!" LOL Thanks for sharing! So pretty! What a fun card! Oh, the last 2 are this wreath set that I won on Day 1, but haven't received yet -- your door idea is FABULOUS -- very creative -- and I may have to CASE it (when I have my set)!!! So clever, love the door! The embossed squares are perfect panel accents! This is so clever! I wish I had thought of it first. Great card! Love the door you made for this; what a pretty card! Love your door!! (actually, two exclamation points aren't enough to tell you how much I love it)!!!!!!!!!!!!!!!!!!!!!!!!!!!!!!!!!!!!!!!!!!!!!!!!!!!!!!!!!! Beautiful!!!! I just love the embossing too!!!! Thanks for the inspiration!!!! Such a super cute idea! Fun, fun, fun! Just beautiful, I love the two toned look of the ink and your color choices are fabulous! Thanks for the inspiration! 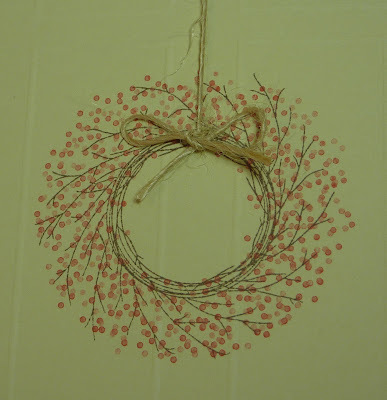 cute door card and love the hanging you used with the wreath. so pretty...i love this card! Oh my gracious me! This is absolutely STUNNING - so beautiful and creative and so subtle with the scoring! love this. The details are awesome. Oh gosh, that door is so perfect! It looks like, well, it looks just like a door! I love it! Beautiful card.....your door is perfect!!! I can't wait to get my wreath all inky after this blog hoppin'! FAB wreath technique and LOVE the scoring for the door panels! Great idea, and beautifully executed! I love this stamp set too but held off buying it until I figure out what to do for Christmas cards. Lovely card, perfect for a new home congrats! Thanks for the inspiration! This is so incredibly clever! Love the twine and the button doorknob. Beautiful job! What a cute card and perfect for new home congratulations. So glad you joined the hop. What a truly cute and unique idea! Love the door and the wreath technique. I love this card. You did an awesome job.